Aluminum Tuna Tower with upper Station and two Outriggers. Excellent condition, price neg. 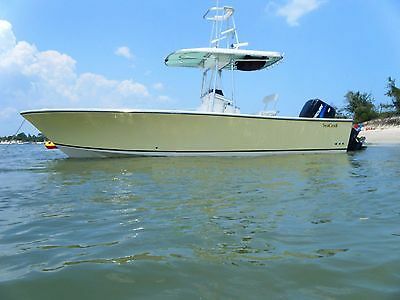 TIARA PURSUIT 3100 TWIN 300HP FWC 350'S DUAL STA. CUSTOM FISH TOWER FAST CLEAN ! 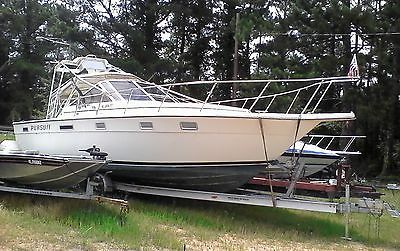 1980 TIARA PURSUIT 3100 FOR SALE. 31' X 10.5' BEAM. 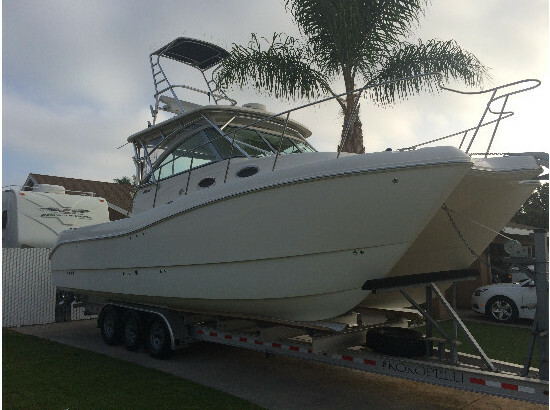 TWIN FRESH WATER COOLED HIGH OUTPUT 350'S.SPORT PAC/MARINE POWER INC. SERIOUS 31' TIARA SPORT FISH FOR SALE! BOAT LOCATED ON PRIVATE PROPERTY IN WILLIAMSON GA 30292. BOTH MOTORS HAD COMPLETE TOP OVERHAULS IN 2013. OSCO EXHAUSTS/RISERS, EXCELLANT TRANS AND RUNNING GEAR. 2- 100 GALLON ALUMINUM FUEL TANKS, 100GAL WATER TANK. 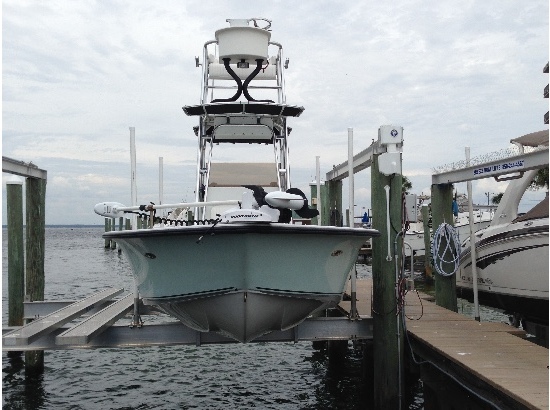 CUSTOM SUPERSTRUCTURE/TUNA TOWER WITH STEERING STATION. FULL GALLEY, SALON, HEAD WITH SHOWER, NEW CRUISAIR MARINE AC UNIT, BOW PULPIT WITH WINDLASS, HYDRAULIC STEERING, RADAR MAST AND TRANSMITTER. MISSING DISPLAY BUT ALL WIRED FOR FARUNO. VHF/HALER NEWMAR BATTERY CHARGER, KENYON 406 ALCOHOL/ELECTRIC STOVE, SWIM PLATFORM W/HIDE AWAY LADDER. QUICK DRAIN OIL CHANGE PUMP AND SYSTEM FOR BOTH ENGINES, MARINCO SHORE POWER CABLE LOCK, CUSTOM PILOT CHAIRS, NEEDS ONE 12V/110V FRIDGE, ONE ADDITIONAL BATTERY AND COMPASS. 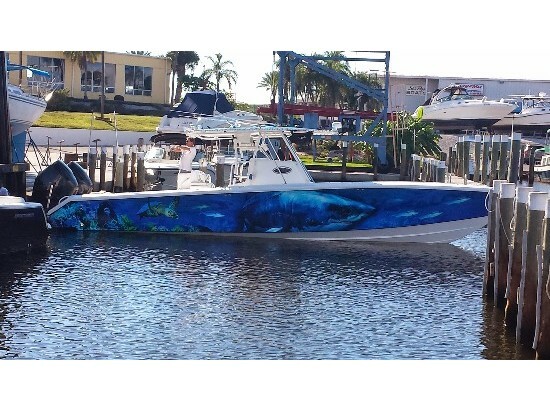 BEAUTIFUL CUSTOM SPORTFISH. SOLD FOR 26K 4YRS BACK. THIS IS A SUPER DEAL ON A VERY WELL MADE CUSTOM TIARA. 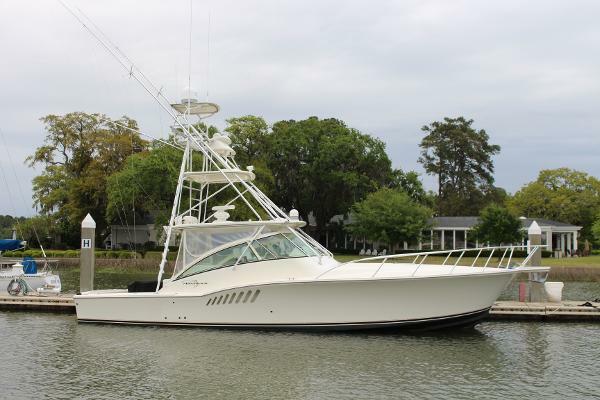 A BEAUTIFUL OFFSHORE SERIOUS SPORT FISH/CRUISER. BEST OF BOTH WORLDS. BUY IT NOW FOR ONLY $6,750.00. A 2K REDUCTION. I RESERVE THE RIGHT TO CANCEL AUCTION IF BOAT SELLS THOUGH LOCAL LISTING. CALL ANYTIME, 404 402 5657. NO PAYPAL THANKS. DIRECT BANK WIRE, MONEY ORDERS OR CASH PREFERED. FULL PAYMENT TO BE RECEIVED WITHIN 3 DAYS OF AUCTION CLOSE. IF YOU REQUIRE OTHER PAYMENT ARRANGEMENTS CONTACT SELLER FOR APROVAL IN WRITING VIA EMAIL. THANKYOU CAN BE TRANSPORTED ON A TRIPLE AXLE TRAILER WITH SEPARATE NEGOTIATIONS OR JACKS AVAILABLE TO RAISE BOAT WHERE IS AND ROLL YOUR TRAILER UNDERNEATH IT. Transport Available, sale for TIARA PURSUIT SPORT FISH ONLY. NO TRAILER WITH THIS LISTING, BOAT ONLY. ALL BOOKS, MANUALS, KEYS INCLUDED. FULL PAYMENT IN 3 DAYS. IF YOU WANT SPECIFIC PICS JUST ASK.....LAST OPERATED IN GA FRESH WATER LAKES ABOVE ATLANTA. The Tiara 3100 Open is one of those exceptional boats whose enduring popularity make her a classic design in every sense of the word. (Indeed, she remained pretty much unchanged from her 1979 introduction until replaced in the Tiara fleet with a new 3100 Open model in 1992.) Aside from her quality construction and sporty profile, the appeal of the 3100 has much to do with her large fishing cockpit and comfortable, teak-trimmed interior with well appointed salon, galley and large fwd. berth. Lots of builders talk about versatility in a particular model, but few boats can really walk the walk. 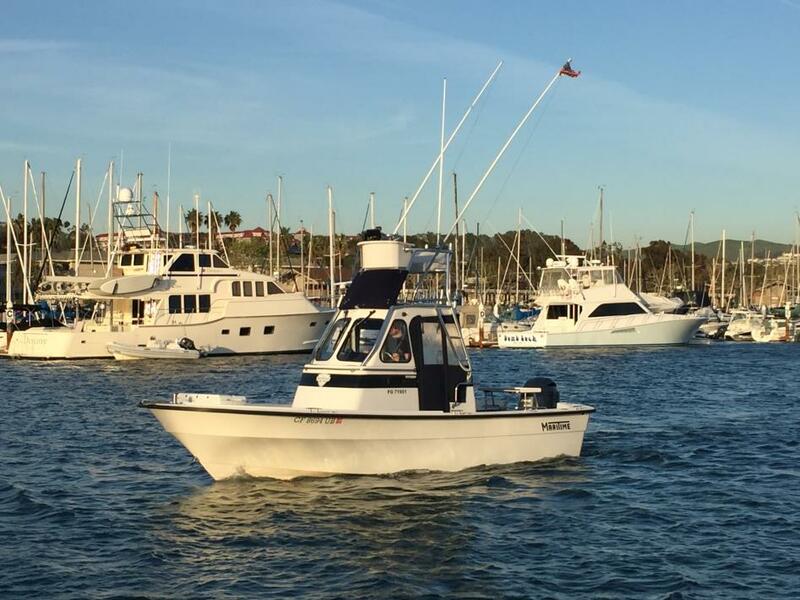 The 3100 does: With the outriggers, fish box and a Live bait well, she's a serious tournament-level fishing machine. For those into cruising than fishing, CD player, radar, swim platform and extra cockpit seating will turn the 3100 into an extremely capable family express with the ability to handle most open-water conditions. Notable features include a full stand up head with shower, wide side decks, bow pulpit, good engine access, 200 gallons fuel and excellent nonskid. Standard Twin 350's gas FWC inboards and readily cruises in the low 20s and reach a top speed of 28-30 knots. A SUPER FIND AT A SUPER PRICE! 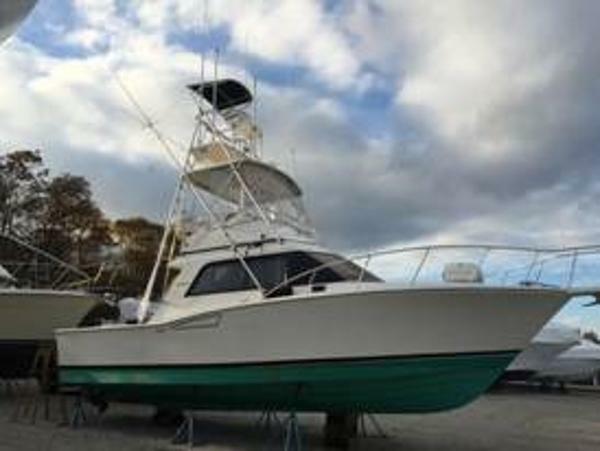 1973 Bertram Sport Fisherman Short tuna tower and lower station with full steering, controls and SW gauges; twin Yanmar 4 cylinder 240 h.p. diesels Model 4LHAM-STP; installed in 2008 approximately ONLY 80 HOURS! 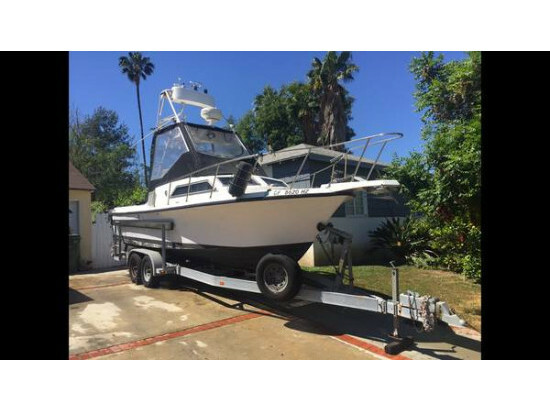 ; 26+ knots cruise; Racor fuel filters; Hynautic steering; 3 battery bank fully automatic battery charger; Four D-24 Deka marine batteries; Updated April 2017: engine heat exchangers, transmission oil coolers, cooling systems, raw water pump impellers - all removed and cleaned out; Updated new in 2008: fiberglass and aluminum engine beds; high tensil 1 3/8 shafts; new propellers; fiberglass cockpit deck and console area; large engine boxes w/insulation; dripless stuffing boxes; Starboard cockpit side panels; new wiring, switches, panels and SW gauges; dual station Morse controls & cables; Boat Leveler trim tab control; raw water intakes (new screens in April 2017), valves and filters; Risers and mufflers on engines; 2 spare propellers & shaft nuts; 5 bilge pumps; two 110v. A.C. shore lines and adaptors; A.C. breaker panel; Morse bow and transom lights; running and anchor lights; engine box and cockpit seat cushions; 2 Danforth anchors w/deck mounts, anchor lines and chains; 4 ICOM VHF radios; Raytheon RIO/11xx radar on top of tower; Standard Horizon CP170C GPS; 3 compasses; 2 electronics instrument boxes on tower; life jackets; transom boarding ladder; fresh water shower in cockpit; extra cleats and rod holders; 2 fire extinguishers; instructions and manuals; spare engine parts; Trinidad Blue bottom paint March 2017; underwater hardware painted w/zinc paint March 2017; and many other items. SOLD IN AS IS CONDITION. Although the boat has been very well cared for, it is the buyers responsibility to have the boat investigated by a marine surveyor in such detail as to assure a full acceptance and satisfaction upon purchase. 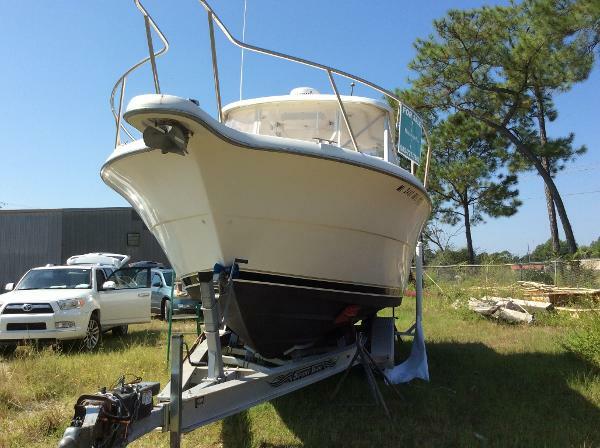 1995 Tiara 3100 Open $10,000. PRICE REDUCTION ON THIS ALREADY FAVORABLE PRICED TIARA PURSUIT! GET A JUMP ON THE SPRING BOATING SEASON WITH THIS TOP OF THE LINE TIARA! NEW PRICE $49,900. M/V Bon Secour, is a unique Tiara Pursuit 3100 Sport Fish with twin Volvo diesels, tunnel drive, tuna tower, out riggers and low hours on both generator (51) & engines (1,147), offered at a very reasonable price. Shortly after being bought by the current owner in 2009, the tuna tower and outriggers were removed and put in storage. Lift kept and used lightly for pleasure cruising until 2014 and since has been kept on a trailer. Engines & maintance checked for sea trial (June 2016); Sea trialed well. Upgrades include Garmin GPS/Radar/Chartplotter (2013), 8kw Generator (2011), reupholstered cabin cushions (sent out currently). 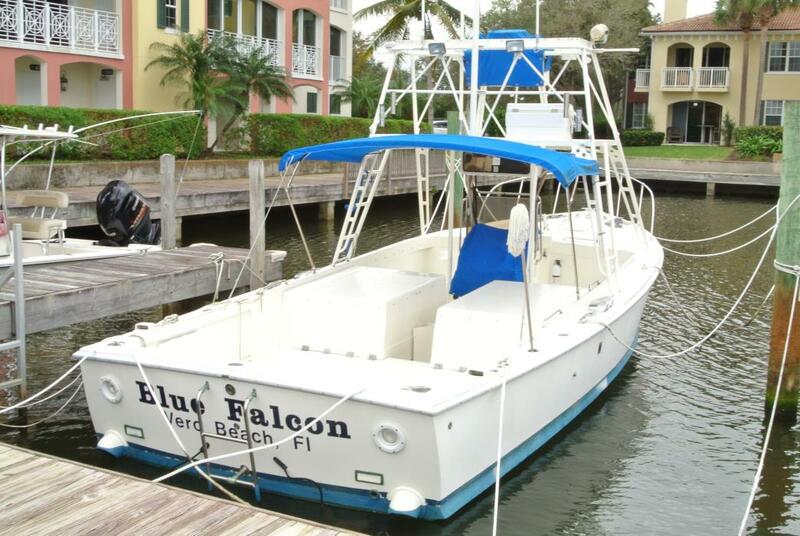 "Bon Secour" is equipped with a full galley & air conditioning for all your cruising, fishing and overnight needs. In addition to the unique characters of this particular Tiara Pursuit, the owner had a custom Sports Trail triple-axle aluminum trailer. Trailer is being sold separately. Asking $6,750. 1996 Cabo Yachts 35 Flybridge Sportfisher Twin CAT 3208 435hp 1425 hours each - Repowered in 2000, Brand New Interior Upholstery, Underwater Lighting, Reverse Oil Change Pump, Raymarine C120 Navigation, iPod/ Auxiliary Connection, Hull Recently Soda Blasted & Barrier Coated, Galley Up, Double Stateroom, Teak & Holly Sole, 40 Gal. Molded Transom Bait Tank, Aluminum East Coast Style Rails, Windlass, TV in Salon, AC/Heat, Port & Starboard Tackle Centers, Rebuilt 5kw Generator, Marine Metal Tuna Tower w/ 4 Sided Enclosure. Broker sold this CABO new originally. Boat has always stayed local. Current second owner has maintained the boat to stay in excellent condition.